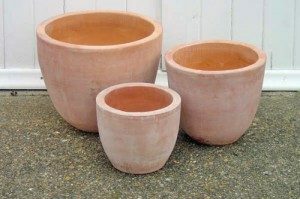 The Red Mud Hut started importing and retailing high quality Italian terracotta pots and planters over 27 years ago, all of which were directly sourced from the potteries by us ensuring high quality attractive products. Terracotta has and always will be our true passion especially when it comes to large scale and specialist designs. One of the original designs was our Terracotta Double Rim which we still sell today due to it's classic and clean design. 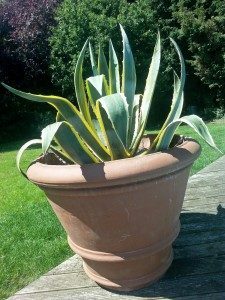 Right: Our large terracotta double rim pot measuring 1 metre in diameter planted with a large scale Agave in our own home! This pot has been outside now for 3 years showing a complete lack of weathering. Over the years, changes in our clients tastes combined with changes in the materials available to potteries have led to us constantly adapting our terracotta range which is now comprised of Vietnamese and Chinese terracotta pots. The Vietnamese terracotta is crafted using a high quality clay from the Mekong Delta which gives a light modern terracotta that is hand finished to give a smooth and contemporary finish such as with our Vietnamese Terracotta Egg Pot.